These large flying drone Heartless fire a super laser that tears apart anything in its path, friend or foe. While regular attacks will not stagger the Destroyer, jolting it with Thunder magic will disable its super and double laser. The Destroyer is an Emblem Heartless that is found in Kingdom Hearts 358/2 Days. It is one of the bosses in Twilight Town. A Destroyer is a large, red, funnel-shaped, mechanical Heartless with a diamond-shaped opening in its front, exposing its glowing, yellow eyes. Two indigo, diamond-shaped guns are mounted on either side of its body. Each of these guns sports a silver, pyramidal spike on both of its ends. 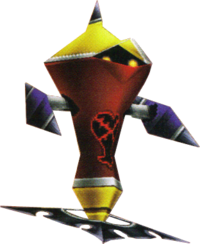 There is a black ring that acts somewhat like a gyroscope hovering around its base, despite not being directly connected to the Heartless. This ring bears a vague resemblance to the top half of the Nobody symbol. The Destroyer has a silver spike on the top of its head, and its Heartless emblem is just below the opening for its eyes. The top and bottom halves of its body are yellow. The Destroyer's name references its mechanical nature and great power, as a "destroyer" is a small, fast warship. It may also simply refer to the verb "destroy", which means "to damage beyond repair". The Destroyer can be a bit difficult to defeat. Before attacking the Destroyer, the several Minute Bombs that aid it should be targeted first, allowing Roxas to obtain extra Heart Points. Once the Minute Bombs are taken care of, quickly Lock-On to the Destroyer and begin hitting it with aerial combos and offensive magic. The Destroyer will use both a physical attack and shoot a long-range laser beam. The physical attack has a 20% chance of dealing the Radar Zap status effect and the laser beam has a 100% chance of dealing the Null Defense status effect. Both attacks can be avoided by keeping out of attack range or by using Dodge Roll or Glide. Use the Thunder spell to Jolt the Destroyer to allow extra damage to be dealt and disable its laser attacks. It has the most HP out of any Heartless in its family, but the combination of physical and magic attacks, and even a Limit Break, can devastate it. After its defeat, Roxas may obtain a Shining Gem. This page was last edited on 2 May 2018, at 17:08.